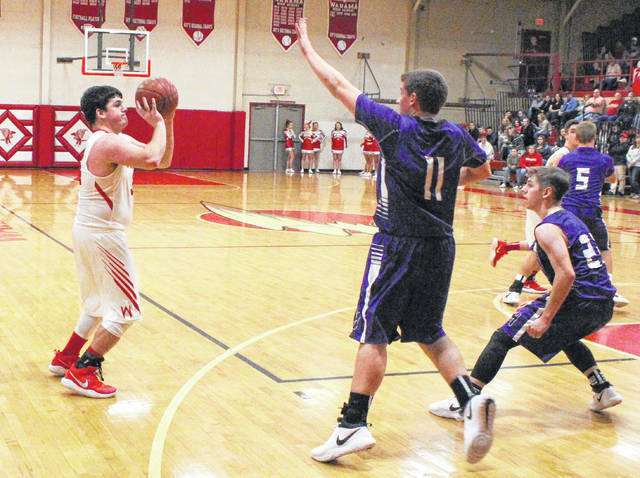 Wahama junior Tyler Bumgarner, left, releases a three-point attempt during the first quarter of Friday night’s TVC Hocking boys basketball contest against Miller in Mason, W.Va.
MASON, W.Va. — In the end, the team that wanted it more got it. Visiting Miller made a 28-8 surge over an 11:31 span in the middle quarters and ultimately rolled to a 62-43 victory over the Wahama boys basketball team on Friday night in a Tri-Valley Conference Hocking Division contest at Gary Clark Court in Mason County. The host White Falcons (0-3, 0-2 TVC Hocking) led 2-1 less than a minute into regulation, but that lead lasted just 21 seconds as the Falcons (4-0, 3-0) countered with a 14-6 run over the final 6:57 of the opening canto en route to a 15-8 advantage through eight minutes of play. The Red and White — who were playing in their home opener — closed the gap down to 20-19 following a Jacob Lloyd basket at 4:55 mark and were also within two points (22-20) with 3:37 left in the half, but MHS answered with eight consecutive points during a 10-2 run that allowed the guests to secure a 32-22 cushion headed into the break. 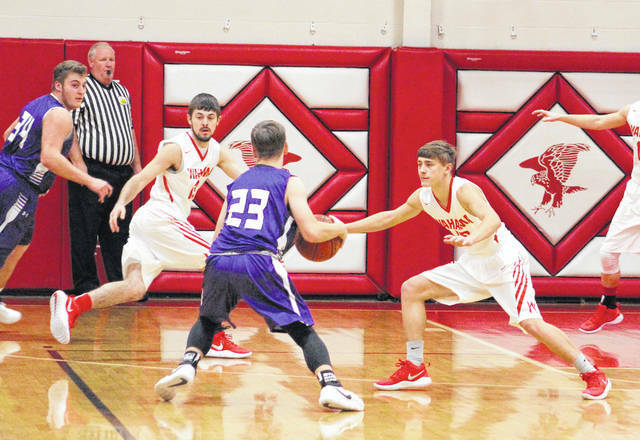 Wahama committed seven of the eight turnovers in the third frame, and the Purple and White took full advantage of the situation by making an 18-6 charge that ultimately slammed the door shut on the outcome while taking a 50-28 edge into the finale. The White Falcons closed regulation with a small 15-12 run and eventually came as close as 17 points (60-43) with 43 seconds left, but Collin Pargeon scored the final basket eight seconds later to wrap up the 19-point outcome. Miller made 16-of-28 shot attempts (57 percent) over the middle frames, while the hosts netted just 8-of-26 field goal tries (31 percent) over that same span — including misses on seven of their first eight attempts in the third quarter en route to a 3-of-11 overall effort. That, combined with seven third quarter turnovers, ultimately sealed Wahama’s fate by night’s end — and WHS coach Ron Bradley completed agreed with that statement following the contest. “It was a two-point game there close to halftime, then it was 10 going into the break. We just didn’t match Miller’s intensity coming out of the break … and that was the difference,” Bradley said. “I talked to the kids after the game about being mentally and physically tough because we are just not displaying that right now. When teams challenge us, we need to respond. Despite a glaring difference in height, the White Falcons did manage to keep up with Miller on the boards. The Purple and White finished the night with a slim 31-29 edge in rebounds, with both teams hauling in nine offensive caroms. Wahama committed 16 turnovers in the setback, compared to only 11 miscues by the guests. The Red and White connected on 17-of-50 field goal attempts for 34 percent, including a 3-of-13 effort from three-point range for 23 percent. The hosts were also 6-of-8 at the free throw line for 75 percent. Noah Litchfield led WHS with a double-double effort of 11 points and 13 rebounds, followed by Tyler Bumgarner with 10 points and Lloyd with nine markers. Jacob Warth was next with six points and Anthony Ortiz also added three markers. Abram Pauley and Skyler Estep completed the White Falcon tally with two points apiece. Pauley also hauled in five rebounds in the setback. MHS netted 27-of-54 shot attempts for 50 percent, including a 4-of-12 effort from behind the arc for 33 percent. The guests were also 4-of-9 at the charity stripe for 44 percent. Alec Eveland paced Miller with a game-high 15 points, followed by Seattle Compston with 14 points and Carson Starlin with 13 markers. Colby Bartley and Pargeon also chipped in seven points apiece to the winning cause. Levi VanBibber and Drew Starlin rounded out the scoring with respective efforts of four and two points. Bartley hauled in a team-high seven rebounds, while Starlin and Pargeon each grabbed six boards. 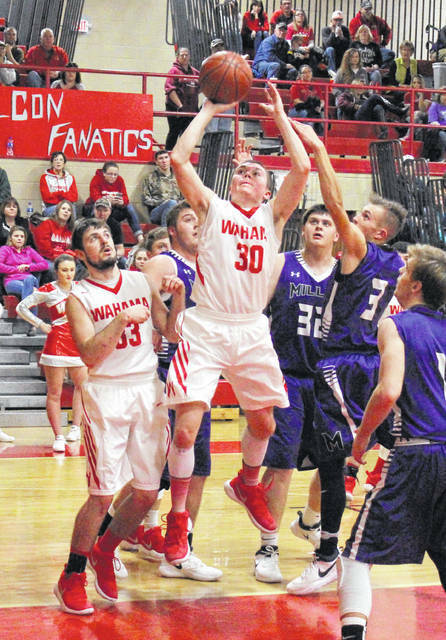 Wahama returns to action Tuesday when it hosts Trimble in a TVC Hocking contest. NOTE: This story will appear in the Tuesday sports editions of the Gallipolis Daily Tribune, Point Pleasant Register and The Daily Sentinel.